Xtrons TS708L multimedia met GPS navigatie functie. De model voorzien van een Android 8.1 besturingssysteem. Powered by the new upgraded Android 8.1 Quad core processor and 2G RAM,you will enjoy a smoother user experience.It also keeps you up to date with the latest features. Different UI changes the way you use your head unit with a range of 4 color combinations.The user interface is very intuitive and is designed to perfectly integrate into your vehicle.You can choose from a variety of UI colors and designs to best match your taste and vehicle.Finally,personalize the interface of your XTRONS unit to match your driving entertainment syle perfectly. XTRONS TS708L has a high resolution,sensitive and intuitive touch screen,offering you a super sharp image display and a smooth user experience. 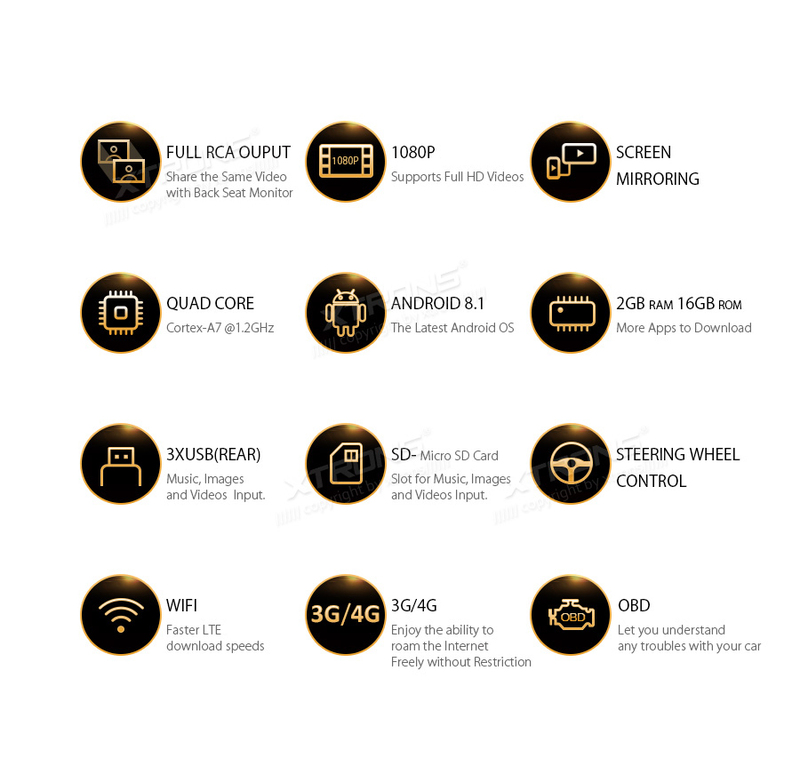 Equipped with the latest video decoder chipset,The TS708L supports playing 1080p video and is compatible with most video formats,allowing you and your passengers to view your favorite movies on the road. 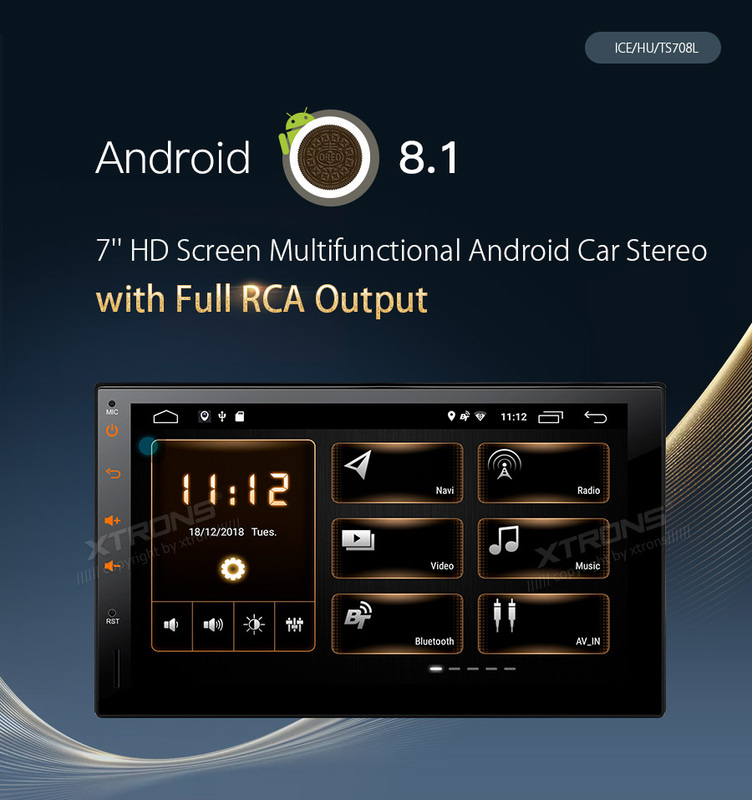 Screen mirroring allows you to mirror your phone's screen on this unit.You can choose to read message or watch video directly on the screen of this head unit instead of your phone.Just connect your phone and go. You can surf the internet on your head unit simply by using your mobile device as a hotspot. Note: This unit is also compatible 3G internet.4G & 3G dongle (Both are optional, XTRONS 4GDONG001 and 3GDONG008 are compatible), need it, inquire with us now! Allows wireless connection of a mobile phone for hands-free communication.For maximum comfort and driving safety,wireless audio streaming from phones and access to your phonebook is also enabled. Support Sygic,iGO,Waze and any other navigation software that is compatible with Android OS.Never worrying about getting lost now. With the steering wheel control function,you can switch songs,change channels and adjust volume at your fingertip,keep your eyes on the road. The USB DAB tuner uses the most advanced digital technology to deliver radio reception with outstanding,noise-free sound quality. Note: DAB is not included. XTRONS USBDAB01 is compatible. Need it, inquire with us now! With the OBD2 function on this unit, you can retrieve realtime data and trouble codes from your vehicle's computer. All the data from your vehicle is presented in an easy to read format. XTRONS TS708L comes with a DVR input, just connect a XTRONS DVR , it will captures every event that occurs on the road ahead, also provides safety features such as collision avoidance. /Note: DVR019 is optional. Need it, inquire with us now! 1. Browse on the Internet with ease with 3G dongle (Optional) or 4G dongle (Optional). XTRONS 3GDONG008 & 4GDONG001 are compatible. 2. OBD02 (Optional) A window for you to diagnose your car status.